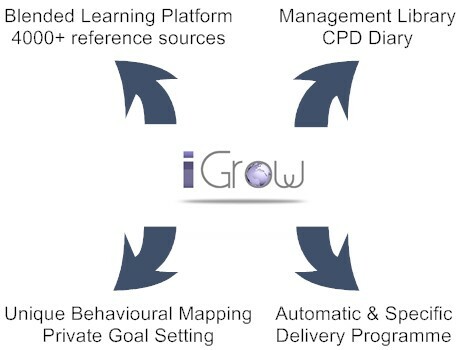 iGrow Personal Development Manager is an online system to help you and your clients manage and support Personal Development Programmes. It is much more than just a record keeping system, iGrow actively identifies behavioural change goals and then delivers blended learning content to encourage, motivate and support that change every step of the way. At its heart is a unique blended learning experience that converts each company’s Competence Framework and Behaviours into a series of drivers and associated content. This means that each iGrow installation can be customised for each company’s specific Competence Framework. Once an individual has selected the specific behaviours that he/she intends to develop, iGrow delivers relevant blended content on a regular basis over a period of time. iGrow can include modules for ad hoc management queries, individual goal setting and target monitoring and continuous professional development (non-vocational CPD) logging. It can also be used to direct content at individuals involved in company training programmes for pre and post reading of course content. In short iGrow Personal Development Manager is a completely customisable, continuously adaptable dynamic learning platform for behavioural development programmes. It can be specifically tailored to each company’s Competence Framework. You can offer customers all the benefits of a powerful and proven personal development management systems without the costs of internal administrative overhead. iGrow can be branded in the companies or the consultancies’ name. Let this legacy tool provide ongoing marketing opportunities for you and/or your firm and increases the involvement you have with the client. Blended learning platform with access to 4000+ reference sources that caters for individual learning styles including links to books, videos, blogs, games etc. Management library that can be leveraged to design and keep track of the development programmes and processes. Unique behavioural mapping process to envision the learnings and changes expected. Private goal setting module to define measurements and oversee the individual’s development. CPD (Continuous Professional Development) Diary that is easy to use and very powerful and effective to keep track of everything. Automatic and specific content delivery programme that can be tailored to the specific needs of the individual or company. iGrow personal development manager provides employees with independent access to a learning library and personal development tools, the content of which are driven by the company’s Competence Framework. This provides an extremely focused and effective development environment.